As of August, 2017, the Lord has blessed us greatly by allowing us to house both Riverwood and New Hope locations at capacity! We are still accepting residential applications to be placed on a waiting list. 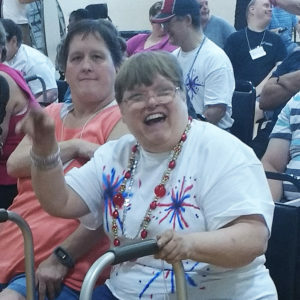 We offer a residential alternative through two residential facilities in assisting residents in achieving their highest level of independence. The staff guides each resident in developing social skills, personal care skills, and spiritual growth. Most residents maintain a job in the community or a sheltered workshop and weekly church attendance is encouraged so that all residents learn and grow in their spiritual lives. The current fee, set by the board of directors, is $1,950 per month. Food stamps, available public assistance, and personal benefits are deducted from this fee prior to invoicing the family for the remaining balance. Download our residential application in PDF format. If the individual meets all criteria, an admissions committee will interview the applicant and a member of his or her family. The applicant and family will be notified in writing of the committee’s decision.